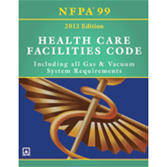 In response to an increasingly decentralized health care system, a growing array of high-tech procedures, and new security demands, the 2012 NFPA 99 has reinvented itself to reflect a new environment where it is the risk that a procedure poses to patients and staff, not the location where it is conducted, that defines safety guidelines. Its new title -- Health Care Facilities Code -- signifies that it is rewritten to make performance criteria for health care facilities more enforceable and adoptable. Move up to a new level of protection and keep facilities up-to-code and patients and staff safe from harm. NFPA's brand-new and best value Medical Gas and Vacuum System Installation Handbook with all the latest rules for Category 1-3 systems plus expert insights, examples, and visuals that help you understand and apply them correctly.